The folks behind The Slayer conjured up a killer hook for their 1982 offering for the ever-growing slasher pile—the only problem is that another, much more famous film arrived with a similar one shortly thereafter. “What if dreams could kill? they wondered aloud, obviously unaware that Wes Craven would drop A Nightmare on Elm Street just a couple of years later, the first of a few events that conspired to consign The Slayer to virtual obscurity for decades. And it’s too bad, too: like Craven’s film, J.S. Cardone’s directorial debut stands apart from the slasher crowd it’s always been thoughtlessly lumped in with, not only because it has a (possibly) supernatural bent, but also because it prioritizes suspense and atmosphere over a high body count. The Slayer also doesn’t deal with the usual set of teens or young adults, either, as it trades them in for a quartet of adults vacationing to a remote island. Surrealist artist Kay (Sarah Kendall) and her husband David (Alan McRae) are especially in need of a break since their relationship has grown a bit tumultuous recently—he doesn’t really understand her artistic decisions and there may be financial issues, too, setting the stage for a tense getaway alongside Kay’s brother (Frederick Flynn) and his wife (Carol Kottenbrook). The idyllic scene grows ominous almost immediately: with tourists having already fled the island, it’s become a hollowed-out shell of itself, full of derelict buildings and empty beaches. A storm swells off in the Atlantic, threatening to bring destruction to the island—if something else doesn’t do so first, as Kay begins having nightmares (the same ones she’s had since she was a girl) of a shadowy, malevolent creature murdering her friends and family. When it grows obvious that her dreams have become a reality, The Slayer feels less like straightforward stalk-and-slash and more like a psychological slasher. In particular, it’s faintly reminiscent of those giallo offshoots where women are gaslighted into insanity by conspiratorial forces behind her. Anyone familiar with those films will hesitate to take the killer dream premise at face value since David sometimes seems like exactly the type of husband who would drive his wife nuts. Cardone and co-writer William Ewing also provide a handful of other possibilities, like a foreboding plane pilot that essentially assumes the Crazy Ralph role with his ominous warnings. Of course, there’s also a chance that Kay has completely lost it and is forcing those dreams come true in violent fashion. All the possibilities play out against the backdrop of that familiar stalk-and-slash, of course, with Cardone crafting some marvelously tense sequences on this desolate island. Something about sleepy seaside slashers just works, and these isolated Tybee Island locales are vaguely menacing in their utter bareness. An abandoned theater sets the stage, acting as a gateway to this weirdly somber scene. You sense from the moment this group arrives that this will hardly be a fun getaway, as the life has essentially been drained of the place, adding an extra, ominous layer to the proceedings, especially when Kay cryptically warns she’s dreamed about this place her entire life. But what really endures about The Slayer isn’t its gore at all. Rather, its nightmarish tone and bizarre imagery leave a more lasting impression. It’s subtly delirious in the way it treats Kay’s descent into her own fractured psyche, as the entire film takes on a slightly unreal tenor. Otherworldly lightning crashes down from the skies, accenting the kind of dread atmosphere that yields nightmares involving severed heads, freakish monsters, and the sluggish, awful sensation of being caught in an inescapable loop. Above all—and perhaps quite unexpectedly—The Slayer is a genuinely unnerving exercise in existential horror once Kay realizes the truth about her visions and dreams. There’s a wryness to it that plays like a familiar “gotcha” twist, but something horrifying lurks beneath the implication here and keeps the ending from feeling like a total lark or gag. If not for the largely forgettable characters and Cardone’s tendency to allow some of those stalking scenes to linger a bit too much, The Slayer might have been completely unimpeachable. As it stands, it is a more than solid outlier for this era, a film that sort of splits the difference between dreamy, Eurohorror artistry and rugged American slashers. While it doesn’t hit the highs of either of those totems, it captures the essence of each and distills them into 90 entertaining minutes that carve out enough space for both visceral and cerebral horrors. After languishing in obscurity since the twilight of the VHS era, The Slayer finally arrives on DVD and Blu-ray from Arrow Films, who have delivered yet another outstanding edition for an overlooked film. It’s sometimes customary to say these editions and restorations help films look better than they have since playing in theaters, but in the case of The Slayer, it might be more impressive than that. Due to its shoddy distribution, this one only played to low-rent grindhouse theaters via rugged, beat-up answer prints, so the full-on restoration on this disc has it looking and sounding better than it did during its release. Short of the handful of folks who have watched the original negative, virtually nobody has ever seen The Slayer restored to such glory. 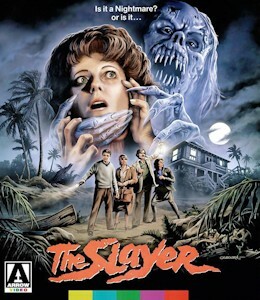 You’ll also get the details about that distribution snafu and much more in “Nightmare Island: The Making of The Slayer,” a 52-minute retrospective that’s somewhat reminiscent of the one found on Arrow’s disc for The Mutilator. For one thing, you can’t believe any sort of retrospective for The Slayer exists, much less one running for this long and featuring so many principal crew members, including Cardone, Ewing, DP Karen Grossman, 2nd unit DP Arledge Armenaki, and effects artist Robert Short. Cardone kicks it off with some musings about his early career writing material for stand-up comics before transitioning to the brainstorming sessions for The Slayer, and the rest of the doc proceeds through the film’s production and distribution. Asides are reserved for specific technical behind-the-scenes work, like the effects and photography (Cardone and company are still really proud of all those roving camera shots). “Return to Tybee” returns viewers to the film’s Georgia setting, which looks much different these days (it’s become more of a tourism hotbed than it was in the 80s). A recent screening of The Slayer was actually held at the theater featured in the movie, and “The Tybee Post Theater Experience” captures the intro, the audience reaction track, and a post-screening Q&A. No less than three supplemental audio tracks are at your disposal, too, with the headliner featuring Cardone, Kottenbrook, production exec Eric Weston, and moderator Ewan Cant. The Hysteria Continues also provide a track, while an isolated score track is features an interview with composer Robert Folk. A still gallery and a film’s trailer finish out the disc, which has been one of the most anticipated in recent memory considering just how long it’s taken the film to arrive on either DVD or Blu-ray. Arrow doesn’t disappoint with a release that’s worth the wait and then some, especially since The Slayer benefits mightily from being freed from the murky depths of VHS transfers and bootleg copies.